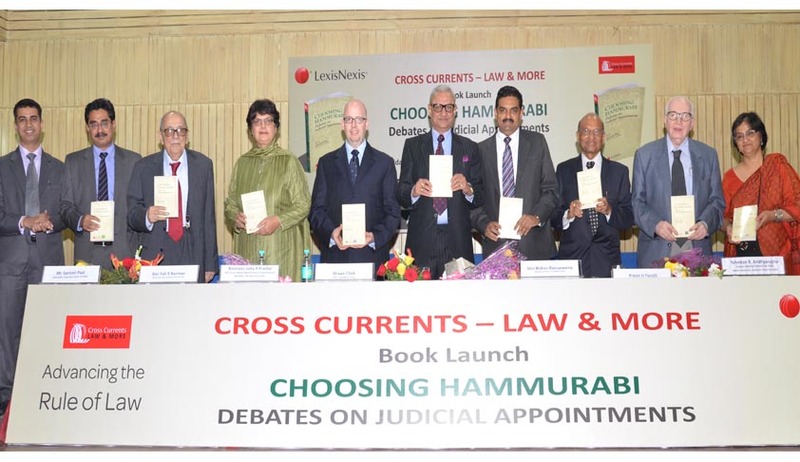 Book Release : "Choosing Hammurabi"
Justice Deepak Verma released the book "Choosing Hammurabi" edited by Advocate Santosh Paul and published by LexisNexis which debates on judicial appointment. Baroness Usha Prashar, Chairperson of UK's First Judicial Appointments Commission and Member House of Lords, Fali Nariman, T.R.Andhiyarujina, former Solicitor General of India, P.H. Parekh, President, Confederation of Indian Bar, Mohan Ramaswamy, MD Lexis Nexis, Abha Thapalyal Gandhi, Publishing Director were also attended the function. Baroness Usha Prashar spoke at length regarding the achievements of Judicial Appointments Commissioner in the UK in making the judicial appointments more transparent, selecting from a wider pool of talent, bringing in diversity by having more women and unrepresented groups like women, blacks and Asian minorities. Mr. Praveen Parekh who was counsel in all the Three Judges Cases viz. S.P.Gupta, S.C. Advocates-on-Record Association and the presidential reference gave some insights into the minds of the Judges who decided these three landmark decisions. T.R. Andhiyarujina expressed his fear whether the new system sought to be introduced would be a greater evil than the current collegium system which has been unsatisfactory. Mr. Fali Nariman through particular reference to a quote in the book by H.L. Mencken wherein he said "Beware of all politicians at all times, but beware of them most sharply when they talk of reforming and improving the constitution." Mr. Nariman admitted that the interpretation of Article 124 was stretching the meaning of consultation far wider than perhaps contemplated by the drafters. However, the interpretation became necessary at that point of time given the circumstances. Santosh Paul, the author of the book said that the judicial independence is a factor which has to be taken into account whenever any system of appointments is sought to be introduced. The Judicial Appointments Commission U.K which has made great strides in bringing in transparency, bringing in wider consultative mechanism, selecting from a wider pool of talent, bring in diversity by appointing larger number of women, blacks and Asian minorities on the bench has taken special care to secure the independence of the judiciary. No politician is on the JAC in UK. Whereas the proposed JAC Bill pending in Parliament has half of the JAC consisting of political appointments. Besides the supersession was institutionalized under the new act. He called for the leaders of the bar to make an appropriate response as independence was seriously compromised. The Cross Current series of Lexis-Nexis is seeking to bring the books on law to a larger audience. This is the second book in the series.